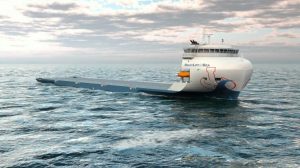 Hamburg-based engineering company [email protected] has unveiled a basic design of a heavy cargo deck carrier for offshore wind projects. The heavy cargo deck carrier for offshore wind projects in the North and Baltic Seas is currently being built at a Chinese shipyard, the company said. “Our client for this project, a Hamburg-based shipping company specialising in offshore wind projects, is already operating a deck carrier, which is to be supplemented by a more flexible high-performance new-build. The ship will initially transport wind power components for offshore wind turbines in the North Sea and Baltic Sea,” said Hendrik Gröne, Managing Director of [email protected], explaining the project. The DC 10000 carrier has been designed to transport heavy cargo and large modules as well as components that cannot be lifted by crane due to their weight or structure, like fragile steel structures for the oil and gas industry, but are rolled onto the loading deck. Since the ports at which the ship will call include a very small one in Denmark, the [email protected] team simulated these conditions at the Danish shipbuilding test facility in Copenhagen and included the result in the design’s calculations. The loading deck of the new carrier has an area of 3,600 square metres and is therefore particularly large in relation to the overall dimensions of the ship, which has a length of 148.50 metres and a width of 28 metres. Among other things, this was achieved by designing the superstructures with the deckhouse, which can accommodate a crew of 21, to be as compact as possible. Another special feature of the flat deck is its extremely high load-bearing capacity, both in terms of distributed load and point and linear loads, [email protected] said. This is said to ensure a high degree of flexibility when using the heavy goods transporter, which has a total load capacity of around 10,000 tons. “In the first few years, the deck carrier will transport wind power components in the North and Baltic Seas, and we have optimised it for this purpose,” said Gröne. The heavy goods transporter is thus also prepared for equipping with DP2, making it suitable for work in highly complex offshore projects worldwide. To optimise the diesel-electric propulsion to the ship’s size and achieve maximum manoeuvrability, the generators under the aft deck were divided in an unconventional way, which also resulted in high energy efficiency, the designer said. The deck carrier reaches a speed of around 12 knots with this propulsion. The propulsion exceeds the current environmental requirements with exhaust gas purification using SCR catalytic converters. The steel cutting ceremony for the heavy cargo deck carrier with the basic design DC 10000 was held at the end of November 2018 and the delivery is scheduled for the end of 2019. Meanwhile, the [email protected] team based at Veritaskai in Hamburg-Harburg has already won the contract for the next basic design – a special ship for offshore wind operations.